A REGIONAL Enterprise Plan targeting up to 10,000 new jobs in Waterford and the South East, and a new 3D Additive Manufacturing Training facility, were launched in the city on Friday last. 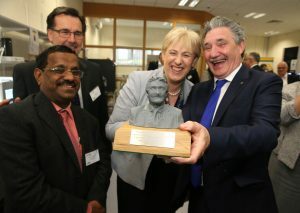 The launch took place at the South-Eastern Applied Materials (SEAM) Research Centre at Waterford Institute of Technology (WIT), which also celebrated 10 years of services to industry. Minister for Business, Enterprise and Innovation, Heather Humphreys, TD attended the launch event with Ministers of State John Halligan and John Paul Phelan, and Frank O’Regan, Chair of the South East Regional Enterprise Plan. The event was also attended by Oireachtas members, MEP Sean Kelly and other dignitaries. The South East Regional Enterprise Plan identifies five strategic objectives, aiming to build a greater resilience into the South East’s economy through more clusters, increasing entrepreneurship, creating a ‘Smarter Region’ with support for the green economy, branding and marketing the South East as a place of choice for investors and talented people, and ensuring the region speaks with one voice on issues relating to critical infrastructure. It also aims to make the South East a ‘learning region’ which responds to the skills needs of business in the region, as well as developing tourism in the region through a South East regional identity and a network of greenways, blueways and trails. The two main objectives of the original Action Plan for Jobs: to have a further 10 to 15%, which equates to 9,300 jobs new jobs by 2020; and to reduce the unemployment rate of the South East have also been carried forward. In officially launching the Regional Enterprise Plan, Minister Humphreys acknowledged the huge progress that has been made in the region over the past decade. “Clearly a lot has been achieved by the businesses and entrepreneurs in this region, but I am under no illusions that we need to do even more. “In particular, I want to see unemployment in this region fall more in line with the State average,” she said. She said the collaboration between five Local Authorities will lead to the establishment of a new Ireland South East Development Office to support the implementation of the plan and continue to drive collaboration within the South East. 3DWIT, an initiative of SEAM (South Eastern Applied Materials) Research Centre, which will be instrumental in both training industry in new manufacturing techniques as well as providing prototype development services, was also launched. Following the opening of its metal 3D printing centre in 2014, SEAM is now spinning out 3DWIT for the support and education of industry needs in the high potential and fast growing field of Additive Manufacturing (AM). Minister Humphreys outlined that the project received grant funding of over €1.3 million under her Department’s Regional Enterprise Development Fund (REDF). She hoped the next 10 years would be equally as successful for SEAM. “3DWIT will give manufacturing companies in the South East a competitive edge, and in turn will help to create jobs in many industrial sectors from biomedical devices to precision engineering and micro-electronics,” she added. In addition to the launch of 3DWIT, SEAM also celebrated 10 years of its service to industries and the achievement of securing €1.9m Disruptive Technologies Innovation Fund funding as part of a consortium. The SEAM-led consortium comprised of two SMEs Schivo Medical & Graph Engineering, MNC Stryker Ireland and CREST-TUD. Altogether the project is worth €2.6m. Dr Ramesh Raghavendra, SEAM Centre Director said: “WIT is at the cutting edge of industry-relevant innovation” with SEAM at constantly striving to advance “the cutting edge of innovation” by bringing novel technologies to Irish based industries. The relationship between SEAM and the regional manufacturing sector has been instrumental in the transformation of Waterford as one of Ireland’s leading advance manufacturing regions. SEAM works with 185 companies across Ireland, and in the past 10 years completed more than 2,000 projects for industry. Minister Phelan, acknowledged Waterford as being “the capital of our region” and “the main economic driver”. He congratulated SEAM and looks forward to seeing more collaborative initiatives emerging as a result of the Regional Plan. “I also want to commend the five Local Authorities for their vision and commitment to enterprise in the region by supporting the newly established Ireland South East Development Office,” he said.